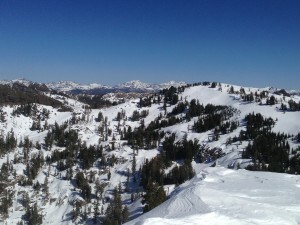 Only five roads cross the Sierra south of Lake Tahoe, and I had only explored four of them until March 6. On that Friday my friend Mark and I climbed Mount Reba along Route 4. Our climb started at the Round Valley Sno-Park – just past the ~7000’ Bear Valley Ski resort and just before the Route 4 winter closure gates. Our adventure trip began very early on Friday morning. As we drove toward the mountains, we enjoyed the sunrise peaking on top of the Sierra to the now green central valley & foothills. 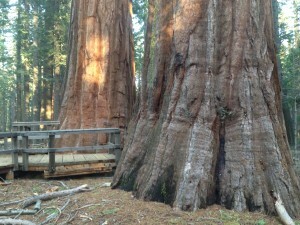 After a hearty breakfast at a local coffee house in Arnold, we past Calaveras Big Trees State Park and drove the Sno-Park. We saw no cars in the parking lot and no one on the trails all day. It felt good to get away, especially since I’ve been working hard and traveling a bit – just life affirming. 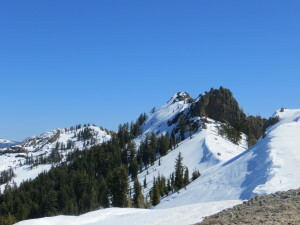 The conditions were ideal – spring conditions w/ bluebird skies with some strong gusts, deep snow in the valleys, and intermittent snow on the ridges. ridge to a saddle. It seemed that each view was surpassed only by the next one. We could see the Dardenelles, Lake Alpine, and other part of the then Mokelumne Wilderness in the Stanislaus National Forest. .
We descended and ascended a saddle and cut across to the summit ridge. The wind picked up, but there was not a single cloud in the sky. We could admire the sky even more when we postholed – a few times up to our hips. The summit ridge reminded me why I liked mountaineering (beauty & sense of challenge). 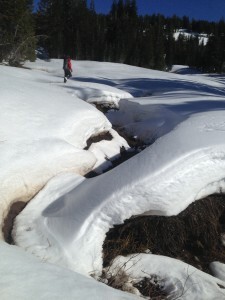 The north side was extremely steep and bordered by a large cornice. 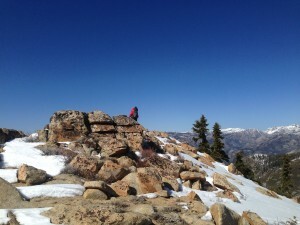 We continued on the ridge to Reba Peak – our highest point at almost 8900 feet. After some Trader Joe treats, we followed the ridge down and up again to Mt. Reba. 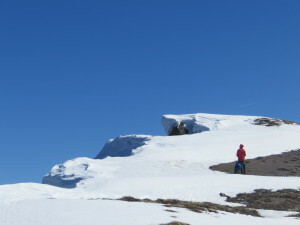 By this time, the ridge narrowed to a razor edge at places which made for some interesting scrambling amidst the rocks and snow. 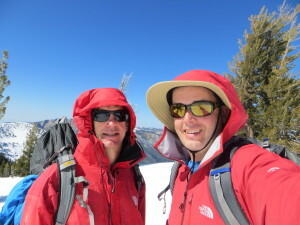 We found the Mt Reba summit marker and enjoyed the 360 view. On one side was Bear Valley and a lower elevation reservoir. We could see our corniced ridge and the peaks of the Sierra between Tahoe and Yosemite in front of us. the steep and mostly bare slopes into Round Valley. We hopped across several streams swollen w/ spring melt and got only marginally wet. The snow was deepest in the valley floor, and the trudge across the valley and back up the ridge was the most tiring. We made our way back the car. After some celebratory food (hunger is the best condiment), we drove down Route 4 across to Calaveras Big Trees State Park. Calaveras SP felt like something out a Mark Twain tall tale (no frogs involved though). The SP protects several Sequoia stands, the largest single living thing on earth (by volume). It’s been a destination since an 1850 gold prospector chased a grizzly bear into a grove of trees larger than he had ever imagined. We hiked one of the interpretative trails to get a taste of the park. The trip was outstanding trip. Even though the trip was less than 24 hours, it felt much longer. This will not be the last time I explore the corridor along Route 4 including Arnold, Calaveras Big Trees SP, Bear Valley Resort, and the Mokelumne Wilderness.